If you are an avid hiker, winter does not mean you have to stay inside. It is another season to see the beauty of nature, to feel the sun upon your face on a brightly lit winters day, to take in the scenery all around you while sipping on a drink from a thermos. It is not a time to be inside, but rather a time to enjoy a different facet of the mountains near our home. For many people, snowshoeing is a great way to be introduced to the glories of winter. If you can walk, you can snowshoe! It is that simple. Start up costs are fairly minimal. Unlike skiing, there is no steep learning curve. If you are an avid hiker (or trail runner), the motion of snowshoeing will seem very intuitive. Go out, grab some snow shoes and enjoy!!!! As with other documents, this introduction to snowshoeing basics doc is not meant to an exhaustive look at the topic. It is a general overview that will help you get ready for a new activity. 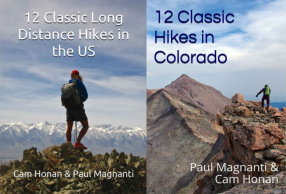 I am assuming the average reader is not new to hiking, but to snowshoeing, and already has the basic, three-season, outdoor skills. 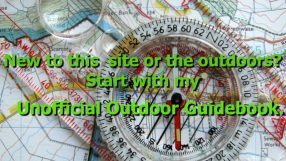 Any person doing an outdoor activity needs to know how to be safe and comfortable in an outdoor environment. This document is also aimed more for day trips than an overnight trip. I also aimed this more at people used to hiking rather than trail running. Many trail runners also enjoy snowshoe running. There are now snowshoes built for the typically packed down trails that most snowshoe races entail (as opposed to a backcountry trail) . The footwear is also a bit different too. There is some overlapping, but it is a slightly different ball of wax. On to the basics of snowshoeing! The first fact of any winter activity is DO NOT OVERHEAT. If you sweat extensively, you will chill once you slow down. Wet clothing = bad! For that reason, it is better to have several layers of clothing rather than one, big and heavy jacket (see below for more information on layering). A quick and dirty rule of thumb is to use the 20 Degree Rule. Borrowed from running, it simply means to dress like it is twenty degrees warmer (or so; use your own judgement!) than the actual temperature. The 20 Degree Rule is just a rule of thumb that can differ form person to person, but overall the logic is the same regardless: Snowshoeing is an aerobic activity.You will be generating body heat and will soon warm up. If you start off the trip and you are slightly cool, you are probably dressed correctly. When you stop, you can always throw on an extra layer. If you overdressed, you will be soaked in sweat and will be cold quite quickly when you stop. How to dress correctly? See below! In winter, it is very important to use layers of clothing. Rather than one bulky garment (that alternately will leave you sweating and then cold when you take it off), it is better to wear a few different layers that you can take on and off as conditions warrant. The wicking inner layer is sometimes wool but is usually synthetic. Think of this layer as your “long undies”. Typically the synthetic underwear is known by such names as Polypropylene, CoolMax, DuoFold, etc. This layer will move the sweat away from your body, helping you to regulate your body temperature. This layer is a very important one for keeping you warm and dry. The middle layer is usually a fleece jacket or a wool sweater. DO NOT use a cotton sweatshirt. A wet cotton sweatshirt will take forever to dry and has no insulating value. Though chattering up in the mountains may be romantic in a “braving the elements kinda way”, it is much easier to enjoy hot cocoa when you are not shivering. If you get cold easily in the legs, some light fleece pants or even expedition weight long underwear may not be a bad idea as another layer. I personally find that my legs do not get cold easily and do not need the fleece pants/heavier long underwear. The third layer is the shell layer. This layer is meant to keep out the wind and the snow. You can use anything from an expensive Gore-Tex jacket to a simple coated nylon pullover. The key is to wear something that keeps out the wind and the snow. I like a simple nylon shell myself. Find it to be more breathable and lighter than a heavy Gortex jacket meant for mountaineering. Your rain gear from hiking will probably work well. You will also need a shell layer for your legs. You can use expensive mountaineering Gortex-type pants, but that is overkill for most people. Your hiking rain pants will work well, or even unlined wind pants if you are on a budget. Keeping out the wind and the snow is the key. I would not use insulated ski bibs such as the ones used for (ughh!) downhill skiing. You will probably overheat and these are not versatile as separate layers. The “puffy layer” is the last layer and is usually thrown on during breaks when it is esp cold and rarely worn while snowshoeing. Synthetics are less expensive, but a little heavier. Down is lighter (and very well suited for the cold, dry conditions of Colorado), but is generally more expensive. It is a good layer to have stowed in your pack. For less than two pounds, it can mean the difference between an enjoyable break to look over the scenery and freezing your tuckus off! Keeping the noggin’ warm is very important in winter. With so much body heat escaping from your head (esp. if you are bald like me! ), it is important to keep in the heat via good head cover. Adequate management of your head gear can mean the difference between being too cold, too hot (and soaked in sweat) or just right. Wool, Fleece or Acrylic Hat: Your standard winter hat. Too cold? Thrown on a hat! Too warm? Take it off! Your most important piece of winter gear in my opinion for regulating body temperature. Balaclava : AKA the Ninja Ski Mask. Not to be confused with a delicious pastry… A very versatile piece of clothing. I find a lightweight one to be the most useful. Roll it up for a light hat, roll it down for a neck warmer, roll it over your ears to be worn with a ball cap, wear it normally for more warmth and protection in the high winds and cold. Sun Hat: When it is not cold out, or you just need light headgear, a simple ball cap will keep the sun off your face. Some people like a broader brimmed hat in the winter. Neoprene face mask: In very cold and windy conditions, the combo of a winter hat, a balaclava and this mask is very useful. I keep it stowed in my pack at all times “just in case”. Goggles: When the wind is blowing fierce, esp if you are in an area with little-to-no tree cover, the goggles make sure you can see! You don’t have to buy anything fancy, even used $10 work well for most people. Note: For the beginner backcountry winter enthusiast, who is probably sticking to lower elevation trails, a standard winter beanie and possibly a sun hat are fine.. As you go to higher elevations or places with more exposure, you’ll definitely want some more items to make a more weather resistant and versatile system! Warm and happy in the Colorado cold. A wool hat with a balaclava working as a scarf. When I think of winter activities, I think of three parts for footwear: The socks, the boots and the gaiters. Boots: While in a pinch, your normal hiking boots may work, they will probably wet-out and not be insulated. If you find you winter trek fairly often, you will want to pick up better footwear for winter. Insulated hunting boots also work well. Even if you don’t have visions of being Elmer Fudd, these boots are a little higher (keeps out snow!) than hiking boots and tend to be highly water resistant. 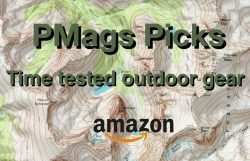 They are often (but not always) less expensive than winter hiking boots and are avail at such places as the Sportman’s Guide, surplus stores and any other stores that cater to the Field and Stream crowd. Remember, many hunters are out all day in the snow and often track their game in off-trail conditions. These boots are little heavier and less flexible than winter hiking boots, but can be warmer. Hunting boots can be a nice compromise between the warmth of pac boots and the lightness of winter hiking boots. Note: There are some overlapping in the types..but the above gives a good, general basic idea of what is avail. Very festive. Not very practical. Glove Liners: A thin liner (fleece or wool) is very versatile. When moving, I find this be enough in many conditions. A glove liner allows you to take photos, eat food, drink water and the other myriad chores without getting your hands excessively cold. I’m a big fan of military surplus glove liners. $5 or less a pair, fairly durable, warm when damp and one of the few items I use for all four seasons. Shell Mittens: Shell mittens will keep the snow and the wind off your liners. I find a shell and liner combo to be very warm, and rarely need a middle layer. Size the shell large enough for your liner and middle layer combo. Chemical glove (or foot) heater packs: I rarely use them, but they are inexpensive and not a bad item to keep in your pack for an emergency. I’ve used them more for others than myself. Unless you are a comic book character with mutant powers, this image is a not a good thing. For winter use, when I am more concerned about warmth than weight (and I am wearing most of my layers), I tend to favor wool base layers (except for the liner socks) as it is more forgiving of sweating I find. In the cold and dry conditions of Colorado, I find wool works very well overall. In three season backpacking, when weight and bulk is a chief a concern (and most of my layers are stowed), I tend to wear synthetics. Any moisture in spring through fall tends to be rain (or very wet snow), so the quick drying properties of synthetics comes in handy. Overall, you may find one combo works better than another based on your budget, availability of what you may already have or just personal preference. Check out this great website for a lot of info as well…. Wool and synthetics. They both work….. SUNSCREEN!!!!!!! – The UV radiation in Colorado, esp. at higher elevations, can be fierce. Bring a small amount of sunscreen. A sun hat is also suggested for similar reasons. SUNGLASSES!!!!!! – For similar reasons to the above, be sure to wear sunglasses. Do not need anything fancy. As long as they have 100% UVA and UVB protection. Even the $15 drug store glasses offer this type of protection now. Most ski goggles offer this kind of protection as well. But, unless it is very windy, sunglasses are better suited for most snowshoeing conditions. I am big fan of safety glasses. Lip Balm – Some lip balm protects those lips from the dry, windy and sunny conditions. A little less cold in the antebellum south…. In winter, it is very easy to not drink. Psychologically, because it is cold, you don’t feel the need to drink as often as during summer. But, it is essential to keep hydrated. Otherwise, you will feel sluggish, not process food as well and ultimately get colder. Not fun! I do not suggest using a CamelBak. The tube tends to freeze making it so you can’t get water. Even the insulated CamelBaks have had mixed results at best. As for food, standard hiking food is fine. You may want to take a bit more quick sugar (like chocolate) to give the body a needed boost if you feel the need to warm up. Also remember that it is better to munch all day rather than have one big meal. Your body is a furnace. Esp in winter, it needs constant stoking! Map/Compass: Don’t need to add too much info on why to take these items! Here’s my a take a repair kit I take for skiing. Works well for snowshoeing, too. First Aid Kit: See above..but the “equipment” is your or your friends! …and a DAY PACK large enough to haul it all in! Note: The weight bearing load is approx. It depends upon the manufacturer and the type of snow conditions. Always read the suggested weight max that is usually listed with most snowshoes. If you live in an area where you can use snowshoes regularly (northern New England, the Pacific Northwest, the Rockies, etc.) there is a good chance many of the outdoor stores will rent snowshoes for a reasonable fee. Good way to try out different varieties and types without plunking down a lot of money. Many of these places that also rent snowshoes will often apply part (or all) of the rental fees towards a pair for purchase as well. Oh yeah..what about wooden versus aluminum ones? There is lovely debate about this issue (odd….but true) For the average person, though, the modern aluminum snowshoes are easier to maintain, lighter and less expensive than the older wooden ones. YMMV. Dogs –If you bring your furry friend, I strongly urge you to keep the dog on a leash. Esp where there are skiers, a dog off leash can run into people and cause an accident. Very few dogs can resist chasing someone moving downhill at a fast pace. For the skiers’ safety, and your dog’s safety, please be honest about your dog’s behavior and keep a dog on the leash if it is one to wander off and/or chase people. Also, remember when the trail signs say NO DOGS or DOGS MUST BE ON LEASH the signs really do mean NO DOGS or DOGS MUST BE ON LEASH. Breaks – Again, something to really keep in mind in mixed-used environments: Please try to not break at the bottom of a hill on a narrow trail. For obvious safety reasons, it is not good to be in the way of people coming down a narrow backcountry trail. Move to the side of the trail and a little aways from the bottom of a hill if you need to stop. Better yet, try to make your breaks at the top of a hill and off to the side. Snowshoeing/Ski Trails: Some skiers are more of a stickler about this than others, but in heavily used areas, it is nice to walk on the side of the trails and not in the middle (where ski tracks usually are) of the trail. Deep in the backcountry, I honestly don’t think it is an issue. (Others my disagree). In popular areas, everyone can agree it is a nice gesture not to put snowshoe-shaped potholes in ski tracks. Skier Only Trails: In some popular areas, there are SKIERS ONLY trails. Please be courteous and do not snowshoe on skier only trails. Often times, there will be parallel SNOWSHOERS ONLY trails in these areas, too. Snowmobiles: I am not a big fan of snowmobiling to say the least, but if they are in an area legally then simply step aside, let them pass, and give a wave and a smile. In an emergency situation, guess who hauls the people out? Yielding: Snowshoes are generally easier to control, more maneuverable and slower than skis (or snowmobiles). Overall, it is easier for a snowshoer to yield to a skier (esp when you are going uphill and the skier is going downhill on a narrow trail) than the other way around. When it is “snowshoer to snowshoer” on a narrow trail, it is like hiking or running – those going downhill should yield to people going uphill. These are not rules, but just suggestions. Use common sense and courtesy above all else and every user can enjoy the winter backcounty together. In Colorado (and other mountainous places), avalanche danger is a real concern. This modest document really can’t go into all the details of this complicated issue. If you are a beginner snowshoer, you are probably not going to be going into any avalanche prone (steep!) terrain. However, as you can gain more experience, you should educate yourself more about avalanches. This link is a good place to start. Hope you found this document enjoyable and informative. As I always like to say: Be safe and have fun! If you have any more questions, please give me a shout. Here is a quick and dirty list of suggested items to brings. As always, what items you bring depends upon your personal comfort and safety level. …..a DAY PACK to haul it all in! A SMILE AND A GOOD ATTITUDE! Next → Next post: Shameless Plug for The Holidays! i read your common sense approach to snowshoeing and appreciated the notes about the clothing the most. sun screen and sun glasses and lip balm, very very useful. i don’t ususally carriy a backpack but may do so in the future to carry the suggested items like a first aid kit, a thermos, and a lunch. thank you. Thanks for the kind words! Have fun on the trails! Excellent primer Paul – thanks for writing/posting this, on behalf of all of us beginners! I found it very useful and educating. Glad you liked it! If you haven’t additional questions, please let me know.